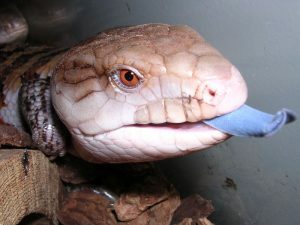 The Blue-tongued Skink refers to a family of reptiles comprising the Australasian genus ‘Tiliqua’, which in turn contains a few of the largest members of the family of ‘Skink’. They have a characteristic blue tongue and are mainly the inhabitants of Australia, where they are widely popular as house pets. 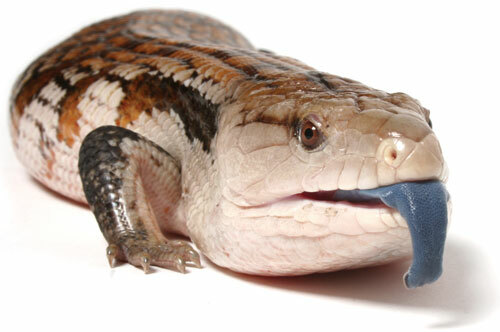 There they are also known as ‘blue-tongued lizards’ or just ‘blue-tongues’. Size/Length: Adults vary between 12 and 24 inches, or 1 – 2 feet. Weight: 10-18 ounces, or 283-510 grams (average). Skin: Smooth and glossy skin with horizontal stripes usually in yellow/orange alternating with black/brown. They shed their skin. Head: Large, broad, blunt and triangular, flattened at the top. Feet: Feet are very small compared to the size of its head and body. Eyes: Round and red bead-like eyes with a black eyeball. 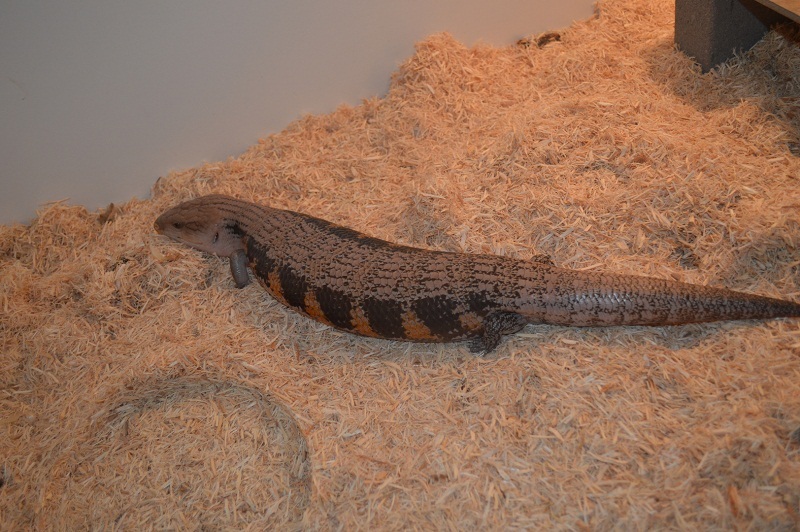 Tail: Thick long tail, gradually narrowing at the tip. Litter size: Up to 25 babies at a time. 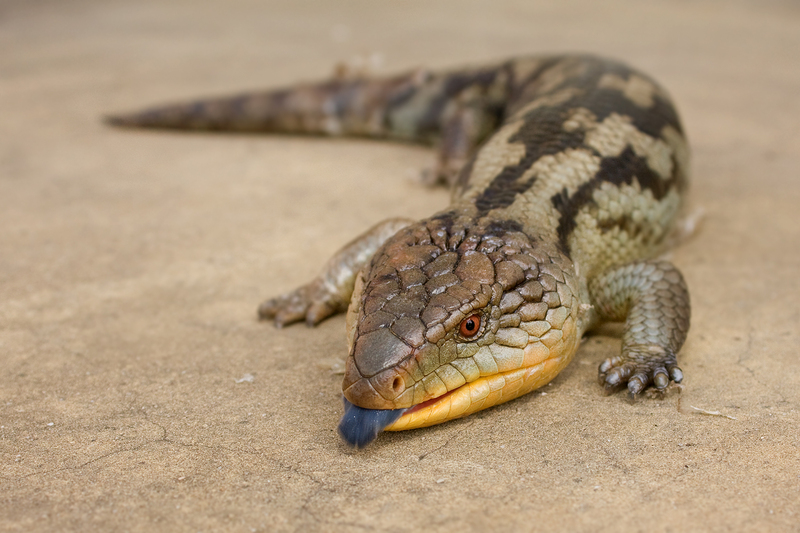 Blue-tongued skinks are spread across the mainland Australia. Few subspecies are also found in parts of Tasmania, New Guinea, and some Indonesian islands. 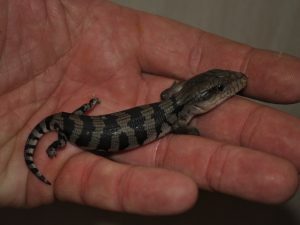 They are spread mainly across the humid areas since these reptiles need moisture. They are found in open woodlands, grasslands, rainforests, at the margins of forest and field, and semi-deserts. Some are, however, found in the desert regions and are adapted to a harsh lifestyle. 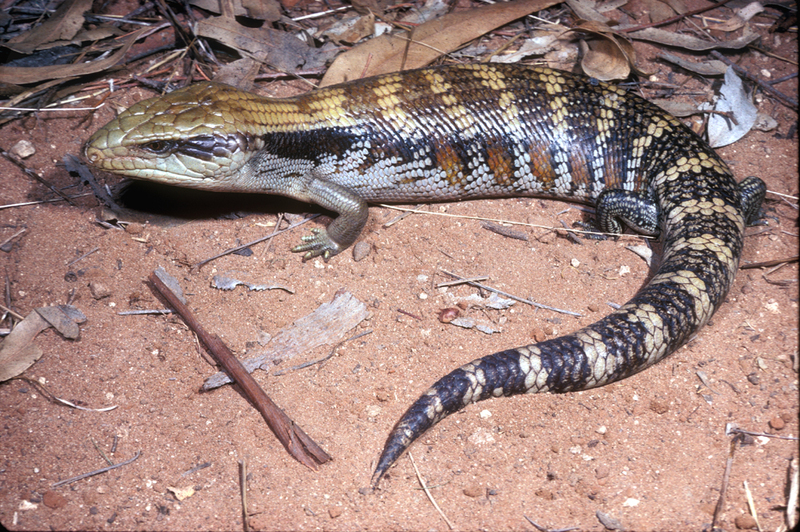 This Australian lizard is a gentle-natured, solitary, shy reptile that would spend its day basking and eating. They are mostly diurnal (active during day time). At night, they rest taking shelter in the wild. They spend most of the time during winter months inside holes and burrows and would only come out for basking in the sun. However, if they feel threatened, they would turn back at the threat and try to scare it off opening their big mouth and sticking out the tongue. It would also puff up its body and hiss. If mishandled or even attacked by the tail, some species of the blue-tongued skinks have the ability to break or pull off their tails on their own as a defense mechanism (though not as quickly as the geckos or the other skink species). A new tail emerges out from its place, but will not look like the original. However, some species of blue-tongued skinks (like the Tiliqua rugosa) do not have the ability to drop their tails at all. 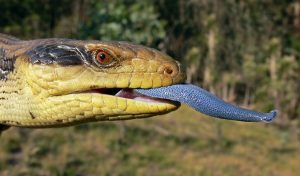 The blue-tongues are omnivores, i.e. they eat both plants and other animals. They would mostly prefer to eat snails, worms, slugs, caterpillars, crickets, small insects, rotting meat, flowers, fruits and berries. These lizards would normally spend a solitary life. However, the males would move out for its mate anytime between the months of September and November. 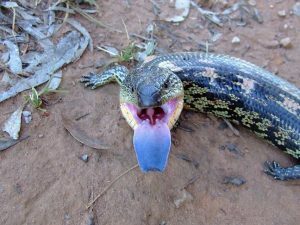 The mating is not a complex process though but often ends roughly with the female getting bruises from the male’s teeth. The female gives birth after about 14 weeks. At a time, the female gives birth to 10-25 live youngs. The eggs do not have any hard shell. 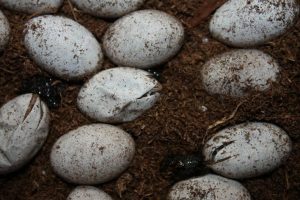 The young ones hatch from soft-shelled eggs inside the female. The females carry their eggs internally which it hatches just prior to the young ones leave the female’s body. The babies, when born, are about 4 inches by size and grow very quickly if they get enough food. Blue-tongued skinks have strong jaws that they can use to crush snail shells and beetles. 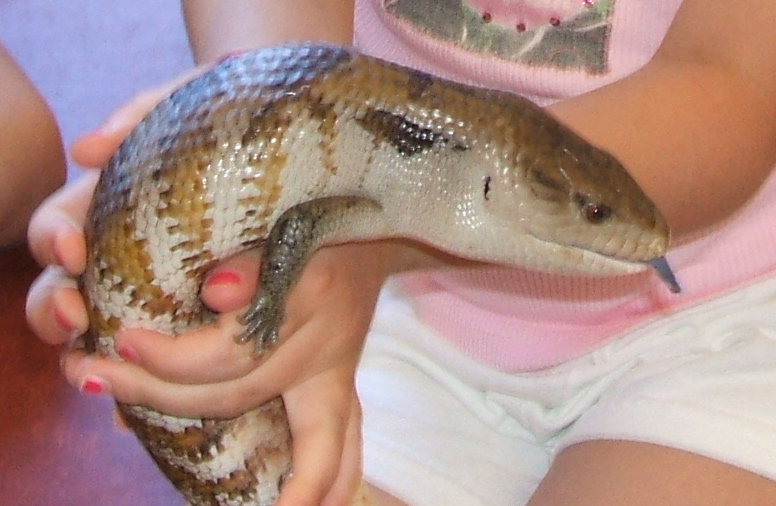 Skinks have heavy tails and very short or missing limbs. This is an adaptation to enhance their ground-dwelling and burrowing lifestyle. These reptiles, like geckos, can drop their tail, to escape from enemies. 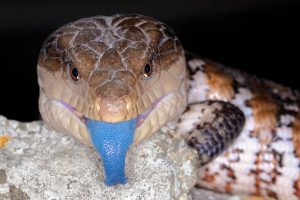 The bizarre color contrast of the bright blue tongue with the large pink mouth cavity is enough to scare off many of its enemies. 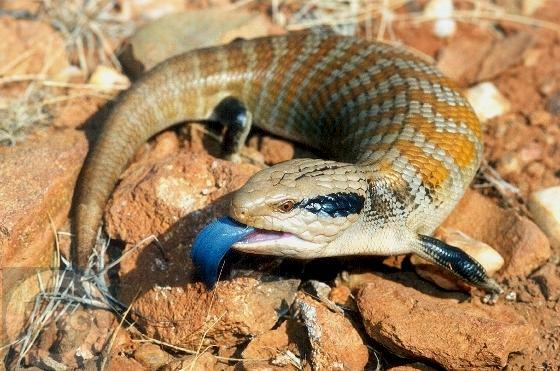 The potential predators of these reptiles are mostly dogs and cats that would eat them. Also, predatory birds like the Brown Falcons and Laughing Kookaburras, large snakes like the Red-bellied Black Snake, Eastern Brown Snake, and Mulga Snake are their main enemies. Home: Minimum 40-55 gallon tanks decorated with hide boxes, rock caves or half logs. Water: Water is an integral part for this creature to sustain its life. Make sure you always keep a bowl of water inside its tank. Light: Regularly expose them to UVB wavelengths. You can use Vita-Lite, Zoo Med Iguana or Reptisun fluorescent lights (5.0+) or even direct sunlight. Temperature: It is recommended to keep an eye on the overall gradient. On the cool side, this should range from the mid-70s to the mid-80s on the warmer side. Diet: For their veggie dishes, chopped corn, carrots, cauliflower, broccoli, berries, peaches, nectarines, pears, juicy fruits, etc. are recommended. For their non-veg diet, they can be served with mealworms, redworms, small crickets, small earthworms, Zoophoba larvae and pupae, fuzzies and crews, and pinkie mice. Blue tongue lizards quickly become used to humans. That’s one reason they are so much popular as pets. 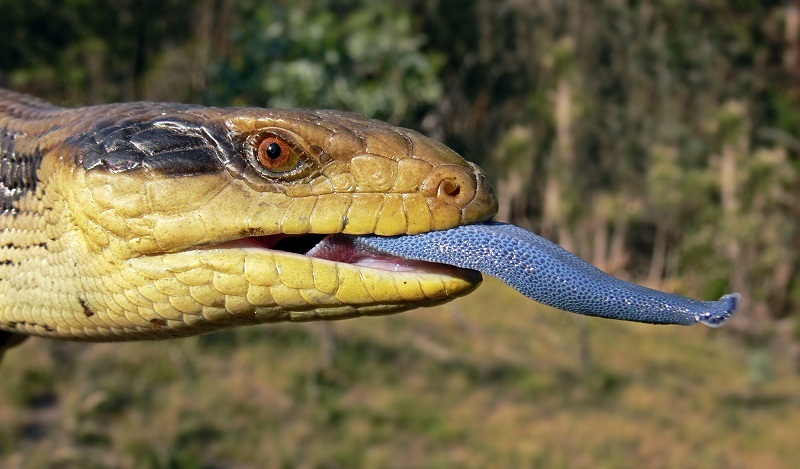 These intelligent reptiles are slow movers and are easy to catch. Even if an individual has never seen a human before, it is quite likely that it would just sit and let you pick it up. 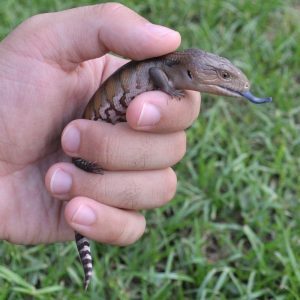 About 50% of skink species lay eggs while the others bear live young. 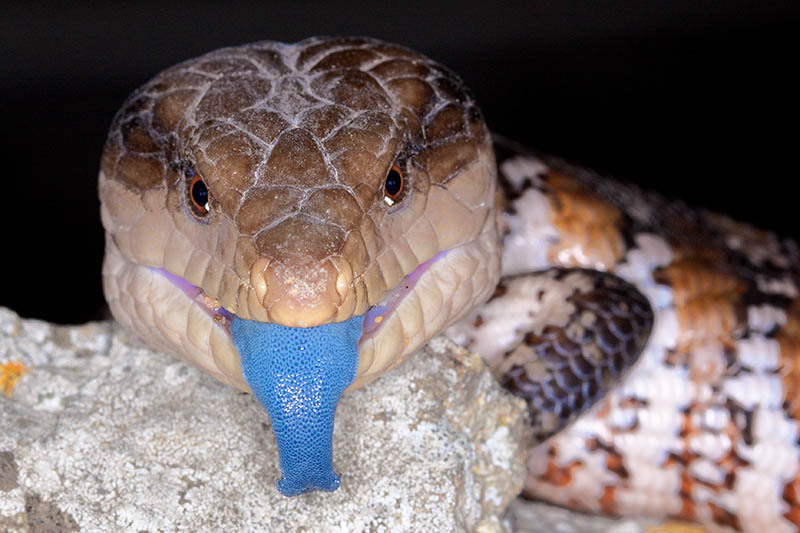 A blue-tongue would bite a human if only provoked or scared. However, its bite is not dangerous since they are not poisonous. The bite makes a bruise though, which usually goes off in a short period of time. Treating the bite (wound) with first aid (like antiseptic etc.) is enough. Their country of origin is New Guinea.